When we think of a ripe pomegranate, we almost always imagine the fruit as a red fruit that slightly resembles an apple at first glance. Although the color is definitely an indicator of ripeness, there are other signs to look for as well in order to tell if the pomegranate is ripe. 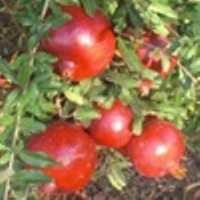 If you are growing your own pomegranate trees or shrubs, you’ll learn quickly how to tell when the fruit is ripe and ready to eat. One way you can know if the fruit is just about ripe is if the skin is tight, hard, and difficult to scratch with your fingernail. This is how you know that you’ll be able to eat the fruit soon. Once you can scratch the pomegranate skin (a bit softer), then you know it’s ready to pick and eat. An unripe pomegranate tends to be round like an apple. But, as the pomegranate fruit ripens, the arils inside the fruit push onto the outer wall of the fruit and the round shape expands into what would look more like a “rounded square” shape as a result. The roundness, when a ripe pomegranate fruit is at its peak, gives way to a shape that is “flattened” on the sides instead of round. Pomegranates that have cracked or split skin should not be purchased at the market because they will quickly mold and be useless for anything other than the compost pile. A fruit with slight bruising may still be okay, but be sure to ask the grocer or market owner if he would accept less than the going rate for those individual fruits. However, if you are cultivating and growing your own pomegranates and see cracked fruit after a rainfall, pick them and use them immediately so you don’t lose those fruits. It is sometimes typical for pomegranate ripe fruit to split following a rain (especially if you weren’t aware the fruit was ripe), so be sure to check your tree or bush after a rain to see if there are any fruits that could be used that day. Using these tips for choosing a ripe pomegranate could save you quite a bit of your grocery money. If you know and understand what to look for in a ripe fruit, you’ll not purchase an unripe or rotten pomegranate without knowing you’ve done so until you return home. At that point, your $3 per pomegranate fruit has been lost. When you open a good pomegranate, you’ll see deep red seeds inside. The seeds will be bursting with tangy, somewhat sour deliciousness. There are many, many ways to enjoy the seeds or to make them into juice. Of course, enjoying this fruit fresh or in your favorite recipe is only possible if you choose a ripe pomegranate in the first place! 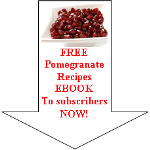 Read enough about the ripe pomegranate and want to discover more about this healthy fruit?